SPEC SD42A Aluminum Flywheel The automotive component most responsible for insuring optimum clutch performance and life is the flywheel. The flywheel's contribution to power transfer is three-fold. Firstly the flywheel should provide a consistent and friction enhancing surface for the clutch disc. Flywheels also aid in proper inertia which is determined by the flywheel weight. Inertia controls the ratio of power to acceleration and can make a vehicle faster or slower based on gear ratio tire type vehicle weight power output and even the location in the powerband output is achieved. The weight of a flywheel and amount of inertia it provides can also effect drivability. Lastly the flywheel must provide a true balance at rpm which means no dimensional runout that produces engine damaging and power robbing vibrations and allows smooth engine revolutions. SPEC flywheels are CNC manufactured at an unheard-of. 001 tolerance in an industry where the standard is. This precision manufacturing process ensures perfect balance and a perfectly flat bedding surface for the clutch disc both of which also contribute to the ultimate in safety for competitive environments. All SPEC flywheels carry SFI certification. (sfi link) To allow for specific inertia needs SPEC flywheels are made in high carbon billet steel and aircraft quality billet aluminum. The aluminum and most steel SPEC units are rebuildable and feature a replaceable steel friction plate that is made from a friction- enhancing steel metal specially formulated for optimum clutch bedding and holding power. The aluminum and steel materials provide a light and medium weight option for all types of racing. SPEC spends a lot of time and effort on research and development of optimum flywheel dimensions and weights for all types of driving and racing and can optimize your MOI (moment of inertia) to maximize your car's output and performance. NOTE : IMAGE SHOWN MAY NOT BE ACTUAL PRODUCT PLEASE CALL FOR DETAILS. Clutches and Flywheels are manufactured on-site using the most advanced methods under the strictest tolerances. We wouldnÂt have it any other way. Our commitment to making the very finest parts is at the core of what we stand for as a company. All Stages Performance Clutches Multi-Disc Clutches Flywheels Pressure Plates and much more. Has been striving to supply and support car enthusiasts around the world with the products and service they deserve. With the economy the way it is we understand how important pricing is. Our car parts are some of the lowest prices around. With that in mind you will not lose quality. We offer auto car and truck parts from nearly 150 manufacturers. Product images may not be vehicle specific. 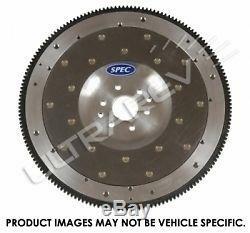 The item "SPEC SD42A Aluminum Flywheel fit Dodge Shadow 87-89 2.2L non-turbo" is in sale since Monday, March 10, 2014. This item is in the category "eBay Motors\Parts & Accessories\Car & Truck Parts\Transmission & Drivetrain\Flywheels, Flexplates, & Parts". The seller is "ultrarevparts" and is located in United States. This item can be shipped worldwide.